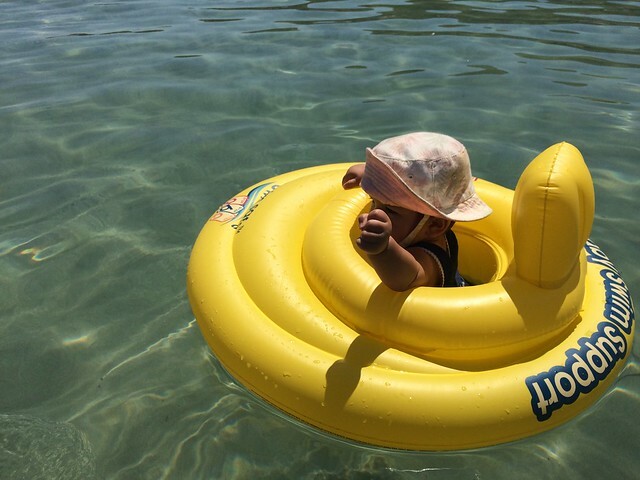 To car seat or not to car seat: This is what I’m asked most, did we bring a carseat? We did, partially because we have a family home in Greece and knew we could just park it there even if we never used it. (She’s still in the infant bucket seat.) But we used it only twice: leaving the airport and going back to the airport. It was nice to have since those taxi rides were a little longer, but otherwise we just didn’t use it. We thought she would sleep in it in the evenings while we were out and that we could just tuck it away by our table, but that never happened. We took a few taxis and held her in our laps – risky, yes, but they were generally short rides in the city with lots of stop and go traffic, so it didn’t feel particularly dangerous. If you’re going to be traveling around a lot, a car seat is a pain since it’s a separate piece to lug around – I wouldn’t do it. If you can just dump it in your hotel room for the duration of the trip, why not? You’ll curse it a few times, but you’ll be safer. Flying! The flight to Greece is about 8 hours, but ours was delayed 7 hours on top of that, so our trip over was quite… long. The good thing was that it was an afternoon flight (4 pm) that became a nighttime flight (11 pm), and so Clara pretty much slept for the duration of the flight. We booked a bulkhead seat in advance, and it was worth the extra money because we then requested the bassinet attachment so that we wouldn’t have to hold Clara the entire time. We dressed her in a long sleeve stretchy cotton romper, footless so that we could add or remove socks depending on the temperature. For food we brought some squeezie puree pouches (which we ended up feeding her during our delay) and many, many Mum Mums. Mum Mums are so good for traveling – they keep the kid entertained, babies can eat lots of them (relatively), they just kinda dissolve so you don’t have to worry about choking. Because they break so easily, I removed a bunch from their packaging and kept them in a plastic Tupperwear container in my purse. For the plane, I organized everything into large ziplock bags. I went a little nuts with Ziplocks, to be honest, but they’re so useful! I had one bag for food stuff (4 puree pouches, a bib, 2 spoons, some formula even though she hates formula (just in case), a small bottle for water), one bag for toys (we brought a few rattles, some soft books that could be stuffed into a bag easily, a Sophie (which we ended up losing), one of those Lamaze toys), even though she preferred to play with like, the airplane plastic cups. We had one bag for extra clothes, one bag for diaper changes (a few diapers, a travel sized pack of wipes, a receiving blanket to put on the change table since they’re easier to pack than change pads). I kept more diapers/wipes in the backpack, but it was a lot easier to grab a Ziplock than it was to rummage through a diaper bag. The flight home was even longer, and this time I was on my own with Clara. This flight was a lot more difficult since it was during the daytime (1 pm) and she wanted to crawl everywhere. When she had a crying meltdown, there wasn’t much I could do except hold her and hope no one hated me too much. I put her in the carrier a lot, which helped speed up the sleeping process. 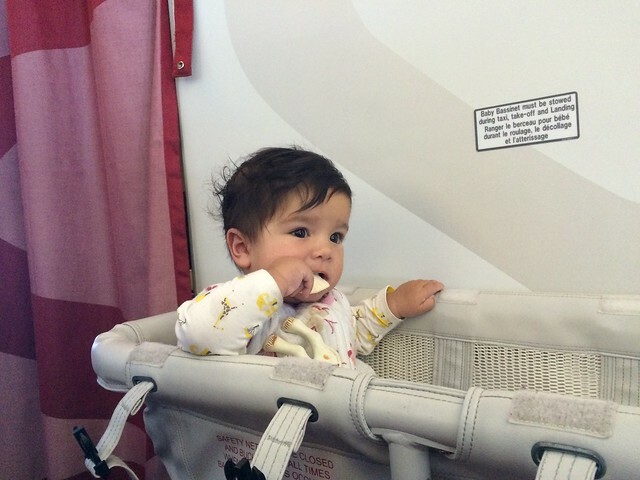 I fed her while she was sitting up in the bassinet attachment and then got in trouble with a stewardess. It wasn’t the most fun. When she did fall asleep on me, I read most of Purity on my phone, so yeah, download lots of reading material since it will be difficult to turn pages in real books. Food: Clara just started solids. When we were at our home base, we fed her the kind of food we give her at home (yogurt, eggs, fresh fruit, veggies). She gets most of her nutrition from nursing still and doesn’t complain if she misses a solid meal, so when we were on the road we weren’t as strict about them. Food was more of a way to keep her entertained when we were out. 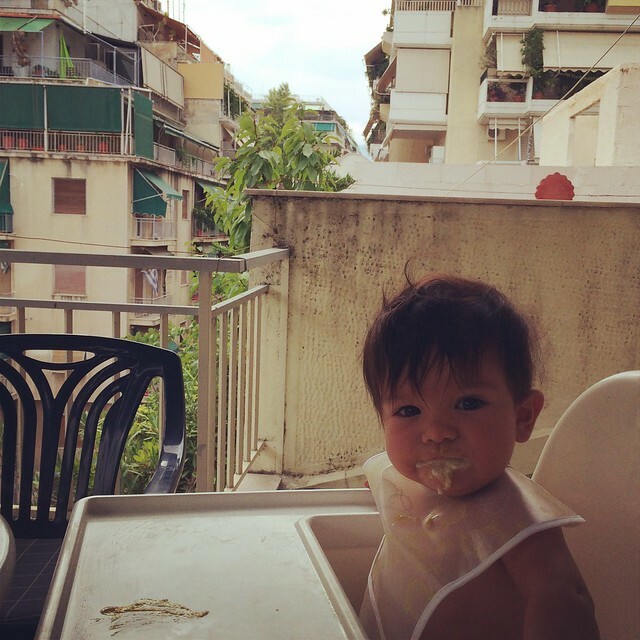 She often ate from our plates – Greek food is great for babies since you can always give them food from your salad, or cooked veggies, etc. We brought a supply of squeezie purees from Canada since we had room in our luggage, although I saw them at the groceries stores in Greece, so you could just buy baby food abroad. I’m glad I brought a large supply of Mum Mums, since I didn’t find any in Greece (store them in a container in your luggage so they don’t get too crushed). I also brought oat cereal with prunes to mix up if she needed a prune boost. Diapers/wipes: Easy to find abroad, so only bring if you have room in your luggage. Bring a large supply for your first few days so that you don’t have to panic buy a bunch when you land. High chair: We borrowed this travel high chair from a friend literally the day before we left (Thank you, Caroline!) and I don’t know what we would’ve done without it. It was so useful. 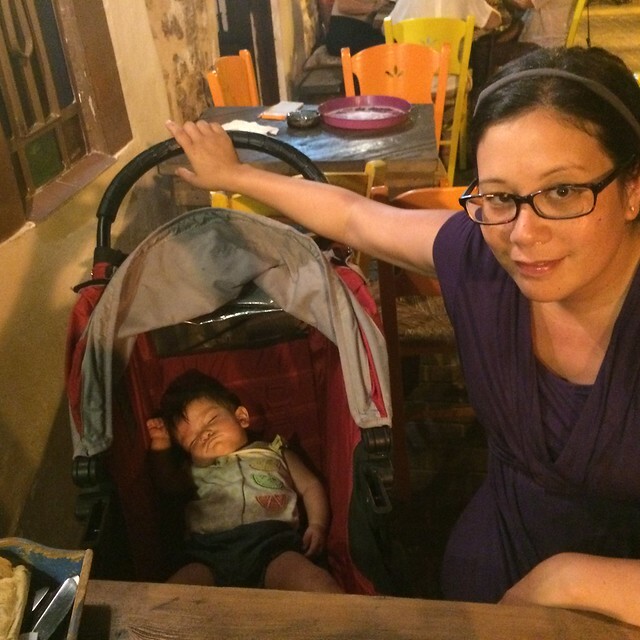 Restaurants in Greece rarely have high chairs, so we brought this with us everywhere, and it screwed on to most tables. In the past we were able to hold Clara on our laps, but she was way to wriggly to do that comfortably at 7/8 months. Stroller: We have a Baby Jogger City Mini, and considered getting an umbrella stroller for the trip, but then decided against it. The City Mini folds up so easily and is relatively compact. Plus, the wheels are sturdy enough for uneven cobblestones, and the basket underneath is a good size. It was perfect for the trip: for pushing Clara around, having her nap in it while we were at restaurants or strolling about, for carrying our luggage when Clara was in the carrier. No problems gatechecking, either. 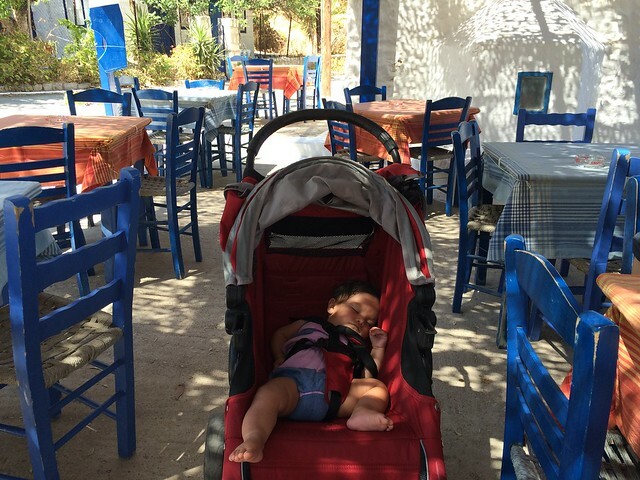 If you’re going to a country like Greece where most of the restaurants are outdoor, it’s generally not a problem keeping your stroller by your table (with the kid inside, I mean, not folded) — there’s plenty of room on most patios. Carrier: We used our Beco Gemini often. Even in the intense heat, it was worth it (we have the grey model, which is maybe less hot than something black). 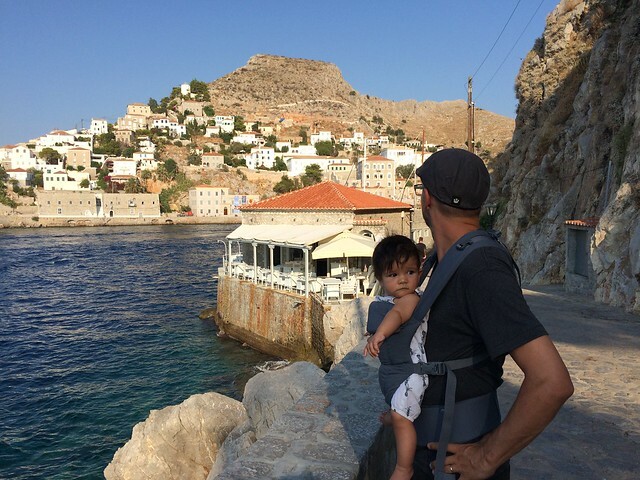 It especially came in handy when we visited the island of Hydra, which has many steps and isn’t the most stroller friendly. I would also always strap Clara on when we were boarding/unboarding ferries, subways, buses – I felt safer having her close to me, and it freed up our hands to carry things. Sleeping: My parents were able to bring a Pack n Play for us, so that saved us on luggage. 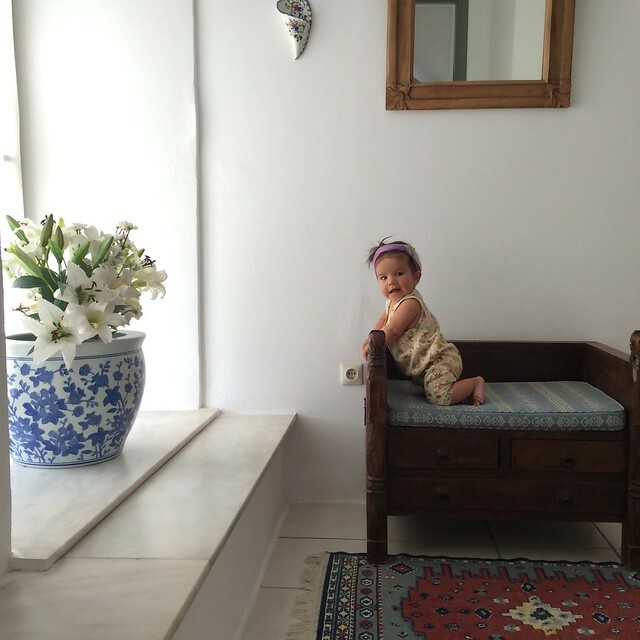 When we were on the road, we’d request cribs, but most of the Greek pension type hotels only had cots, which aren’t very helpful for babies. So, we co-slept mostly at night. We didn’t follow any kind of strict sleeping schedule away – it’s just too hard when you’re on vacation and your schedule is so unpredictable. Mostly we aimed for her to take a morning nap, an afternoon nap, and a late-afternoon nap, and they usually happened organically in her stroller or in the carrier while we were out and about. Because dinner is so late in Europe, we would make sure she got some kind of sleep before heading out for the evening, i.e. a 7 pm nap!, so she would be in a good mood at the restaurant. Or, we would walk around until she fell asleep and then go eat. We would strategize based on what her sleep was like during the day. If she was awake and fussy at a restaurant, one of us would take her for a quick walk outside and this often did the trick – she would fall asleep in a few minutes. But, sometimes nothing worked, and there were a few restaurant meltdowns and “we need the bill NOW” evenings. Eh, it happens. Strangers: People, mostly older women, LOVE babies and are much more forward about it than in North America. Once someone does the grabbing hands gesture, they won’t leave you alone until they have held your baby. This sounds creepy, but it wasn’t, it was nice! 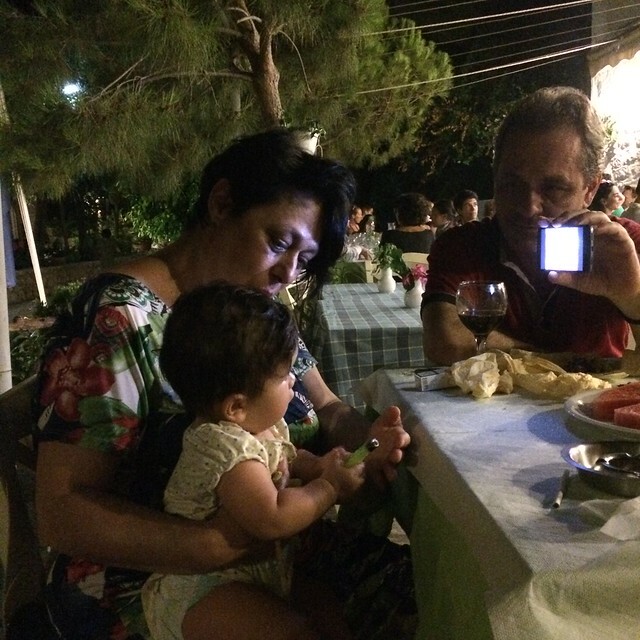 Clara loved the attention, loved the Greek songs, loved the cooing. This usually happened in contained areas – i.e. on a ferry, in a restaurant – so it’s not like we were just handing her off to strangers in the street. In restaurants it was especially useful while we ate our meals. So, roll with it, do what makes you comfortable. One of our most memorable nights was when the couple in the picture above played with Clara the entire night so that we could eat our meal. Clothing: Greece was hot, and the temperature never dipped below 27 degrees. I packed quite a few outfits, but found that the only ones she really wore were one piece rompers. Easy to maneuver when you’re traveling, cool, and they look like a full outfit without having to deal with a onesie + bottoms. Because it was so hot, we usually fed her in just her diaper (less mess) and she would sleep the same way depending on the AC situation. Once we were walking and had the shade up in the stroller, there was usually enough breeze to keep her happy. We made sure to offer her water often too. Overall it was such a fun experience for all of us. It’s a great age to travel and I would highly recommend it! This was so much fun to read! Baby’s only a few weeks old but we’re already planning a trip in the spring; this gives us hope it can be done! Hello,Admin ! Can you remove the link above in my name ?